I was born in Buenos Aires, Argentina and lived there for a few years. Being so young during that time has left me with many child memories such as hot languid summer days, swimming daily in our pool and the wild parties my parents threw in the backyard by the asado – a large outdoor grill area. Of course I have other memories too, but this memory is about one particular trip which left an impression on a 3.5 year old. Mom and Dad came in one morning and quickly got me out of bed and dressed me and then went and fetched my baby sister. We were in a hurry. It was mid March, so late summer and still warm and sunny. Friends of theirs needed some help. I had no idea what awaited me; I just assumed it was an adventure like any other I had already had. We hopped on a plane and flew to Cordoba which is northwest of Buenos Aires and we were met at the airport by a driver. Still sleepy from waking up early and the short flight I was looking forward to the drive ahead. We were going to a friend’s estancia to help the calves. It was calving season and the calves were being attacked by hundreds of falcons and were dying. Dad was asked to come and help. 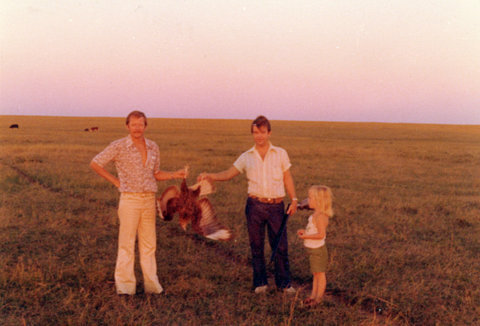 I remember being quite livid that Dad was going to go and shoot at something. So, quietly sitting in the backseat of the car I stared out the window and wondered what was going to happen. Sun was streaming in and the windows were cracked open so my sister and I had a breeze in the backseat with Mom. The driver told us we were approaching the estancia and we turned onto a dirt road lined with eucalyptus trees on both sides. I could see the vast pampas outside and the never ending blue sky, but no cows yet. The tree lined drive also had a fence with wooden posts which were evenly spaced. As if it were yesterday I remember that on each fence post sat a small owl. Excitedly I pointed them out to my Mom who also noticed that the owls were real and that indeed each post was occupied by one. I can only assume that the house on the estancia was quite large and accomodating for the family and their help. 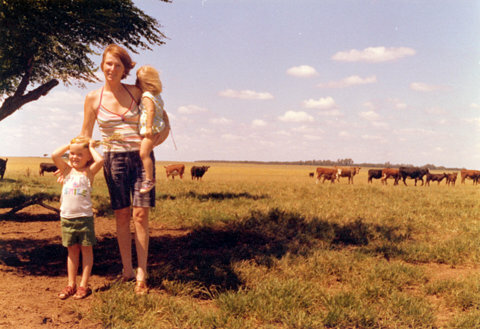 After we all got settled in we were driven out to the grassy fields to where the herd of cows was grazing. Dad went out with his friend with a weapon of some sort in hand. While we waited at the fence, I climbed up to see what the commotion was all about. Then I saw. I understood why the calves had to be helped. The falcons were swooping down on the newborns and eating their eyes, blinding them so that they would stop and could be eaten. Imagine seeing all of this at 3.5! The men went out and made a whole lot of noise in an attempt to scare the falcons away. After all of this excitement we were driven back to the main house and were welcomed with a big asado. I remember the gauchos sitting around with their special knives eating meat and vegetables and most importantly drinking mate tea. Mom and Dad do not drink mate but lots of our friends did. They would pour the tea leaves into the gourd and drink it with a bombilla and pass it around. The tea has a very distinct earthy smell and to this day I love the smell and taste of it. My favorite brand of mate has mountain herbs in it which rounds out the flavor beautifully. Fast forward several decades. Early on when I was just getting into perfumes I was introduced to Lorenzo Villoresi’s Yerbamate and fell in love with it immediately. It took me straight back to that memorable day outside of Cordoba with all the heat, yellowish fields, earth and blue sky. Top notes are citruses, tea, mint, terragon, brazilian rosewood, ylang-ylang, green notes, grass and mate; middle notes are lavender, green notes, tea, grass, mate and hay; base notes are galbanum, french labdanum, oakmoss, patchouli, vetiver, spices, tea, woody notes, powdery notes and green notes. Yerbamate opens up with hefty citrus notes and a blast of cool mint. The opening is quite green and refreshing on a hot summer day. It is citrusy for a good ten to fifteen minutes and then the hint of mate appears. It tingles the nose and all my other senses, awakening my memory. I see vast land around me with not a house or car in sight. I am one with nature. The heat moves in with the perfume giving me the sense of being warm. After a good long hour the perfume morphs yet again and becomes warmer with hints of grass and stronger mate. I tried to smell the lavender but alas, I cannot detect it. When I wear this perfume in summer, the grass and hay notes are quite pronounced. It blooms in the heat bringing out the nuances that I find otherwise hard to detect. The heat allows the vetiver to shine in the end as well. Now is time to wear it to get the sense of drinking mate with herbs. The drydown is quite a different experience compared with the opening. It sits warmly on my skin, creating an aura surrounding me. I am no longer living in the city. I can smell the raw dry earth after a good thunderstorm and downpour. The steam is rising off of the ground and a powdery green mist caresses my skin. If I put my nose to my skin I can smell the mint and the vetiver as well. This is a fun perfume and I recommend it to anyone who is looking for something a little different. This entry was posted in By Sandra, Citrus, Fragrance Reviews and tagged Argentina, citrus, Fragrance, Mate tea, Perfume, Review. Bookmark the permalink. Sandra! What an amazing story. I love it. That you remember it so clearly shows how monumental it was. Sharing such an experience has triggered quite some memories of my own. Bussis. Thanks Val! It sure was monumental. Argentina is a beautiful country. Wish I could just hop on a plane now without saving and planning. Oh I hope you do find your sample. I find it perfect for spring and summer. Wow, your story (and the wonderful pictures) sounds really impressive! I put Yerbamate on my to-try-list since I love both, mint and vetiver. The only Villoresi I know so far is Teint de Neige which I enjoy and find very interesting – but it’s not me (too powdery). I also love Teint de Neige – but in freezing cold temperatures. 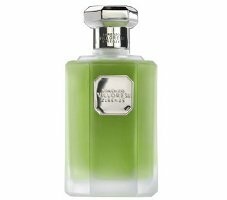 Villoresi has several excellent perfumes. Hope you enjoy Yerbamate. What an amazing childhood you must have had, Sandra. I love the vivid glimpses you share with us. Thanks for reviewing this one. It’s the LV I’m most curious about, having a love of the aroma of mate. Must try it for myself soon. Certainly a nomadic interesting childhood! If you like the aroma of mate you might like Yerbamate. It’s quirky and fun. Incredible story: I am impressed! It is quite a memory for a 3.5 year old! I am curious to know how you felt about it at the time. Were you scared or “drawn in”? My own memories make me think that children have far more acceptance of natural events that adults…if they don’t get scared, that is. I was quite accepting and drawn in to all the commotion. I was taken by hand to one of the calves that was not injured and was able to stroke it. When I saw a hawk swoop down to attack it later I remember getting riled up. Sure, it was intense, but also a life lesson about hard work and the beauty and cruelty of nature. Sandra, as you know, I’ve been waiting for an Argentina post from you, and what an incredible one you wrote! I could quite identify with this, having grown up on a cattle farm (even though ours was a dairy farm and we, quite fortunately, never had an attack on our calves). It must have been both scary to be a part of this, but also it must have made you feel very proud of your father, in the end, for going to his friend’s rescue and doing what had to be done for those calves. It’s been a while since I’ve worn Yerbamate (I don’t own a bottle), but it’s a scent that made an impression on me in terms of its outdoorsiness, and you’ve described it here beautifully. Haha! Drama all around. 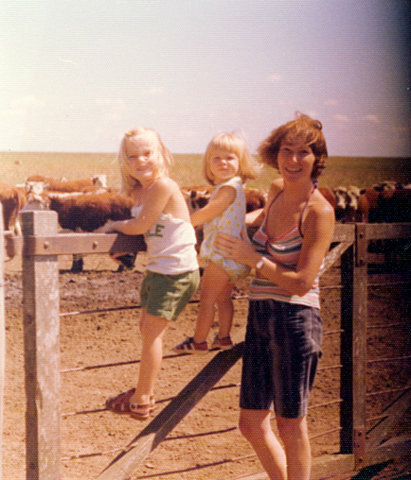 How nice that you grew up on a dairy farm. What a wonderful experience. I can certainly say that from that day forward I saw my father in a different light. All for the better. Those poor little calves. What an incredible story, and you tell it so well. I love finding out all these tidbits about you. Keep them coming please.